Teutonic Tuesday: Tage des 917's! Last week was all about the 959, this week it’s all about the 917 this Teutonic Tuesday! And I see R32rennsport beat me to it! I’m scaling down a bit though, to 1/43 to be exact. And I’m showing a new brand, at least I don’t think I’ve ever seen it over here before. 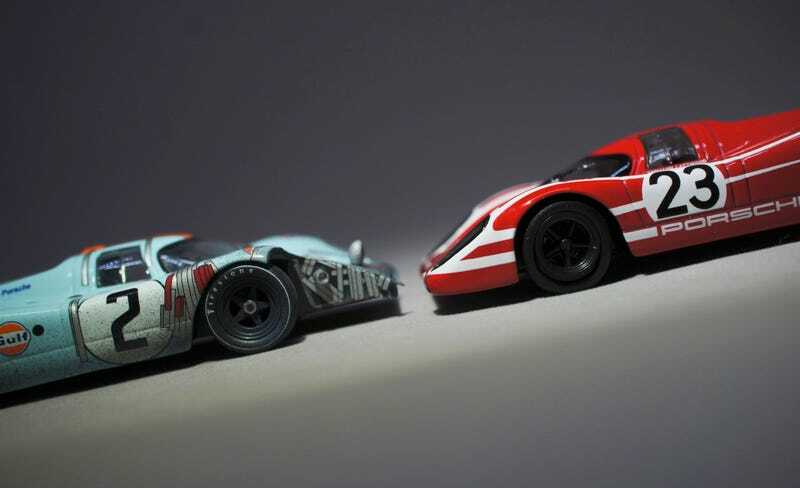 That red one I did show before, it’s the Porsche Museum (by Welly) Porsche KG Salzburg 917K that won Le Mans in 1970. The blue Gulf 917 is the winner of 1971's 24 hours of Daytona. By CMR. And CMR tried to replicate the damage it run into as well. Teutonic Tuesday: Kurzheck gibt mehr spass! And I’m sure I’ve seen pictures of the 1:1 with that extra mounted headlight before somewhere. But looking for it online this morning I don’t seem to be able to find one anywhere using the search terms Porsche 917 daytona 24 1971. That seems odd. TFritch? It has the famous Gulf livery from the John Wyer Automotive Engineering Group. The 917's stability problem (some racers bluntly rejected driving one for Porsche because of it’s well known instability) wasn’t resolved until Porsche partnered up with John. Porsche would develop engines but J.W. Automotive would enter and race the cars. And John and his team were the ones who eventually solved the aerodynamic problems and created the 917 body style we know and love today. But the history on the 917 is well known I suppose. The Daytona 24 hours however was a race that only run for a few years for the FIA World Sportscar Championship. Well, “a few”: It’s not Le Mans that has been on the list for decades. The cars were driving 24 hour as well of course. One big difference though: The race starts in late January / early February. So the nights lasted much longer than in France in which the race is held in summer. Among the drivers, the mixture of highly banked curves of the four kilometer long oval and the track sections in the infield of the course made it a unique long distance race. One that wouldn’t last because the 1971 edition would prove to be the last one. At least: for a year. John also vented his feelings concerning the changing nature of racing already back in 1971, saying, “Racing… is still a sport but includes more business.” Ironically though it were his own wildly successful cars that contributed to the evolution of endurance racing into what it is today: Big business. Or rather: Costly as hell. A year later, in 1972, the Daytona was a 6 hour race. Not due to John’s remarks about the 24 hours but due to the energy crisis. In 1974 it was cancelled completely. And from 1982 the race was finally dropped from the list of races for the FIA World Sportscar Championship. As I said it’s a CMR 1/43. CMR is for Classic Model Replicars. That website won’t tell you anything though, except for an email address. I’m wondering if there’s a connection to the Dutch company of Replicars (holding company for e.g. Neo Scale Models), a former company of Jaap van Dijk, owner of Matrix Scale Models. Traveling Torchbug Tuesday: Reisende Fackel-Käfer auf den such nach seinen Wurzeln! I know Jaap sold Replicars to a German company in 2012 and as CMR are only/mainly available through German shop CK I suppose it’s at least not that illogical. But hey. The model comes with a great kerb stone base. And although I love the weathering of the car, the looks of it being driven flat out for 24 hours, that tape seems to be a bit too “just painted on”. They did however seem to have put one piece of tape sticking out up front, right hand side. So that’s it for me today. I hope to see some more 917s, I know many of you have ‘m! Let’s make this Teutonic 917-Tag as amazing as last week’s 959-Tag! Danke!